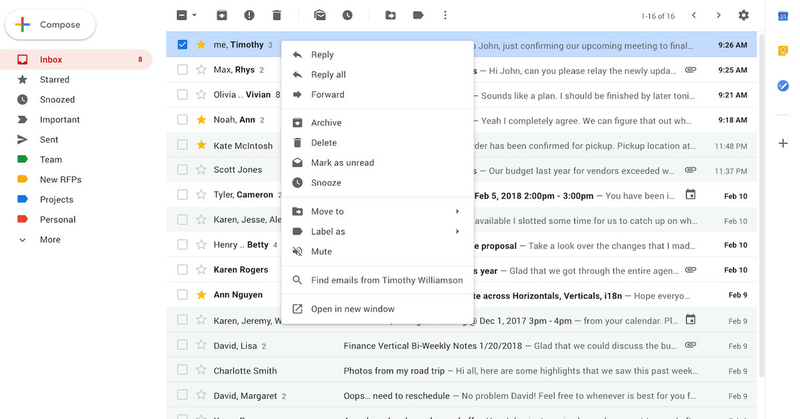 Google finally examines one of the most annoying Gmail web interface queries by right-clicking on the menu, adding many more options to the pop-up list, which should make it more useful. As updates, it's pretty simple: when a click reaches your account, right-click on the email. The email will add options for answering, forwarding, tagging, moving, silencing and postponing mail – options that should have been fairly long. Compare this with the right-click menu that has only three options: to archive, mark as unread, or delete. Google says today's update is being used by G Suite users with Rapid Release domains and on February 22th. – Scheduled Release customers. in a few days in any case. There is no time available for standard free Gmail accounts, although if you follow previous trends, it will probably go to your inbox in the coming days.